It doesn’t appear to be a mainstream USA product. Most of the links go to overseas web sites. Unless the blades have some unique shape, you can likely find blades that fit just based on length, width and thickness. Isn’t there a LJ who runs a cutter supply? Holbren? Is it a re-sharpenable HSS or a reversel TC blade? Reverseble blades are 5.5 mm width and mostly 75 or 82 mm long. Looks like that one takes 3 1/4” or 82mm double sided carbide blades. Bunch of planers take the same style blade. https://www.amazon.com/Bosch-PA1202-Woodrazor-Tungsten-Carbide/dp/B00020J1Q2 looks to be the same style. You might check James Hamilton Stumpy Nubbs site. He has a sponsor that makes cutters. Goood hunting! It has the dimensions so you can check against the ones in yours. Sure looks like it is identical in design to the Porter Cable PC60THPK. 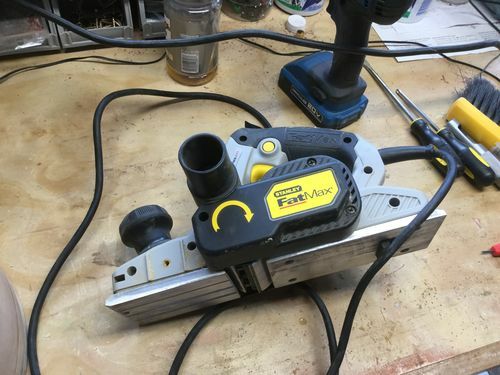 Looks similar to the current Stanley Fatmax 750W so perhaps the blades are interchangeable on most 3.25” planers? Not for me. It’s for a friend. He took the planer back and I’m waiting for the dimensions. The knives in the machine are not double sided but I’m betting they will be the generic ones. Thanks for the responses. I will stay in touch. Looks like the 3 1/4” ones posted by a couple of you are likely the ones so we’re ordering a set. All he has to lose is $11 but I’m betting they fit.